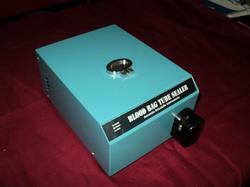 Blood Bag Tube Sealer Machine (Model No. ASTS 10) is a compact equipment to seal the blood bag pilot tube by radio frequency sealing system Sealed tube can be easily separated by pulling the sealing section by both sides.Accurate Scientific is pleased to introduce the latest Radio Frequency Sealing System. Approx 1.5 to 2.5 sec. 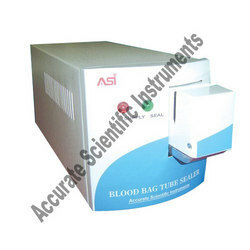 Blood Bag Tube Sealer from Accurate Scientific are compact instruments to seal the blood bag pilot tube by radio frequency sealing system. It takes less than 2.5 seconds to seal per tube but it is depend upon the tube Variation. Sealed tube can be easily separated by pulling the sealing section by both sides. Accurate Scientific is pleased to introduce the latest Radio Frequency Sealing System. Max sealing time Approx 1.5 to 2.5 sec. 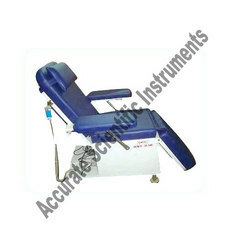 We are the leading manufacturers and suppliers of wide range of Automatic Donor Chairs, which are fabricated using superior quality materials. These chairs have up and down moving facility with variable positioning to make the body Recline and upright. Moreover, our range of chairs are best acknowledged for durability and long lasting features. Available in various specifications, these Automatic Donor Chair can also be custom made as per the clients requirements. 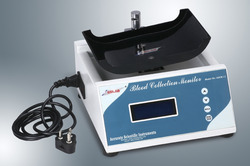 Accurate Blood Collection Monitor (ASCM- 10/11) are compact instruments, to provide smooth and gentle rocking for homogeneous mixing with anticoagulant without clot formation of blood cells during collection of blood from a donor.